One can never neglect the importance of a good security camera. But you don’t always need to spend big bucks on professional camera for home security as you can use old iPhone as a security camera with the help of free IP camera app on iPhone. If you are looking for the best security camera apps for iPhone, you are at the right place. Here we have the list of top surveillance camera apps for iPhone. Using any of these security camera apps on your iPhone, you can easily turn your iPhone into a security camera. Thus allowing you to easily monitor home activities using iPhone as a surveillance camera. Both paid and free iPhone security camera apps are available costing between $0.99 to $5. These apps come with advanced features like real-time monitoring from anywhere, support for recording from both phone cameras, notifications and recording hiding features, etc. However, these iPhone security camera apps are mostly limited to specific features. So it can be a little bit difficult to find the right security camera app for iPhone depending on your needs. Why Security Camera Apps for iPhone? Security is an essential part of our lifestyle, whether it is personal security or security of our assets. From basic locking system to hi-tech security and surveillance systems, we spend a fortune to ensure our safety. 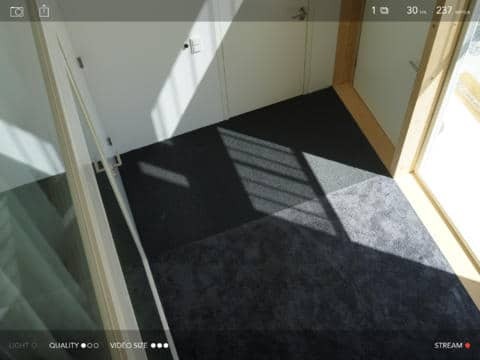 One of the most common security tools is a security camera that will let you see/record a specific area in real-time, so you would know what is happening there while you are away. If you are in search of security camera system for any particular reason, then you don’t need to spend hundreds of dollars on professional surveillance systems. 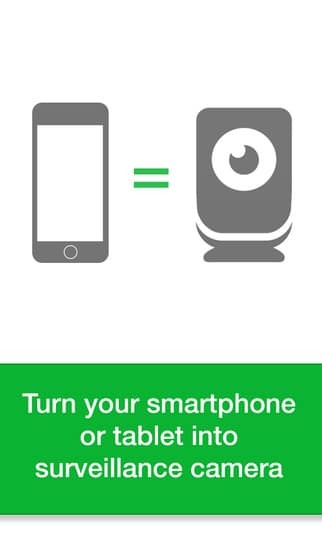 If you have an old iPhone, you can easily turn it into a security camera for free! There are tons of iPhone security camera apps available on the Apple App Store that will let you turn your iPhone camera into a security camera. Earlier we have helped you select the best iPhone security apps. Today, in order to help you with your search for the best security camera app for iPhone, we have created this list of 8 Best iPhone security camera apps. It contains all the apps for both beginners who just need average security and advanced users looking for advanced security features (may cost). Let’s find the best app for your requirement. Warning: Making a recording of any particular area or person without the consent of the person/owner may be prohibited in your locale. So before attempting to record anything, please check the local regulations to understand whether you are allowed to do so or not. You will be solely responsible for any damages or lawsuits against you. iWatcher is not one of the most feature-rich camera apps in this list, but its free nature and ease of use make it perfect for many novice users. The plot is simple, you need to download the app on two of your iOS devices, one will act as a camera and other as the monitor. Now just place the camera iPhone anywhere you want and start monitoring activities on the other iPhone using Wi-Fi or Bluetooth. As you are bound to distance of same Wi-Fi network or Bluetooth, this app only works for monitoring your surroundings. For example, you can watch over your kids in the next room, or just keep an eye on your pet. 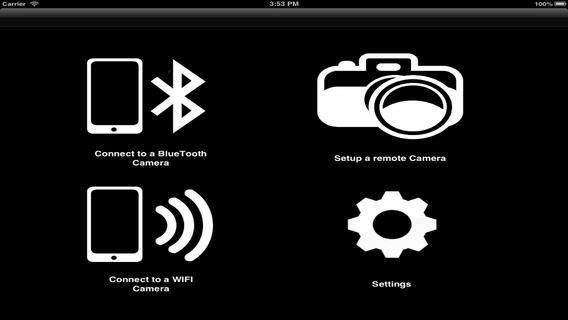 You can also control the camera phone with the monitoring phone, like switch between primary and secondary camera or turn on the flashlight. This is a bit advanced free iPhone security camera app that will let you make a recording of an area while you are away. 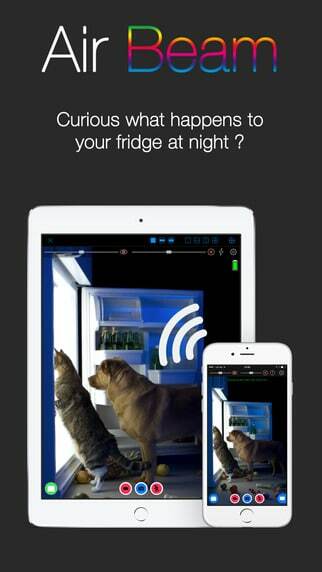 It uses motion detection system, and as soon as the app detects any motion, it will start recording. The app doesn’t offer any real-time monitoring. So it is best for recording a specific area to know what happens while you are away. The recording is stopped after the movement has faded, so you won’t end up with a huge unrequired recording. You can also adjust movement sensitivity so you won’t record unrequired movements like, curtains. Another simple app with easy to control features. It is a paid app costing $0.99, but it offers a perfect monitoring solution for your surrounding. The app will turn your iPhone camera into a security camera. You can monitor and control from any browser on the same Local network. Yes, you are only limited to the range of your Local network, but its features are great. iPCamera app for iPhone can be a perfect choice if your needs are limited to it. You can control the iPhone’s torch, orientation, camera (if both are available), video resolution, quality, and frame-rate. The access to the app can also be restricted using a username and password. This is an amazing app for people who want to monitor activities in real-time from anywhere in the world. There is no need of getting into the hassle of port forwarding and other such complicated things. Mobiscope cloud recording will act as the medium. The process is simple, just sign up for Mobiscope account and download this app. Now just sign-in to this app and start the video on your iPhone. All the content of the video can be monitored from the Mobiscope app if you have internet access. It supports motion detection and notifies you if any motion is detected. However, it is a paid service with a monthly subscription starting from $9.99. 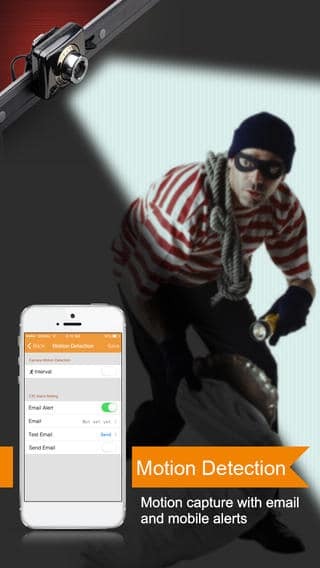 MD SpyCam is a safe recording app that will let you record any particular area with your iPhone. 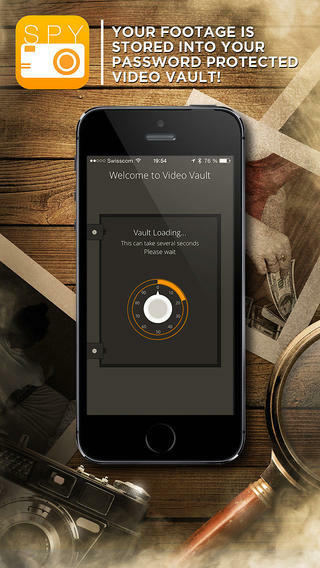 It has a built-in vault system that will record and save all the videos in the password-protected vault. So only you could access the videos. The videos are based on motion detection and as soon as any movement is detected, it will start recording. The app will stop recording as you or someone else touches the display, and save the recording in the vault. It will also take a picture of the culprit if someone tries to access the vault with a wrong password. Apart from motion detection, you can also set it to start recording if any sound is heard. 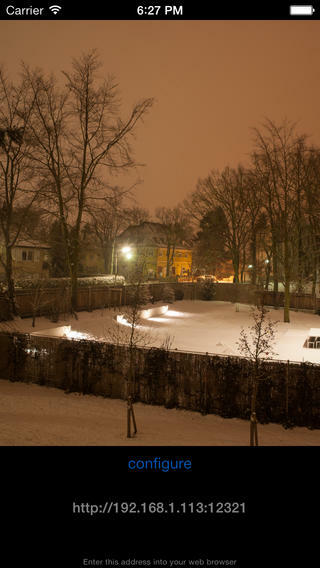 AirBeam is a paid security camera app for iPhone. It offers some really advanced features required by many users serious about surveillance. It has support for multiple camera monitoring. So you can set up more than one iPhone and monitor activities on a single device. The app transmits video over the local Wi-Fi, but if you like to monitor from anywhere with just the internet access, then you will have to setup port forwarding to port: 8123. You will get smooth and high-quality video with HD 720p resolution. It supports both manual recording and motion/audio detection recording. It is also simple to use due to auto cam detect feature, that will detect all AirBeam cameras on a network automatically. AtHome Camera is a feature-rich monitoring and recording app available for free. Just like Mobiscope, it also offers cloud-based monitoring service. So you are not limited to local network and don’t require any port forwarding. You just need to install AtHome Video Streamer to your iPhone device and install the AtHome Camera app on the device through which you would like to monitor. Now you can see all the activities recorded by the iPhone on your choice device. Its advanced features include, motion detection along with alerts, Two-way communication, encryption, control camera, hide the app and schedule recording. There is also a professional version available with added features and support. As the name suggests, Instant Webcam is all about setting you up and ready for monitoring instantly. It is the easiest app to use mentioned in this list and doesn’t require any kind of special setups. All you need is a browser and this app on your iPhone. Just paste the URL provided in the app in any modern browser on any device and you will immediately start streaming. You can set up more than one iPhone devices and even have multiple views of a same iPhone camera. It will also let you control the iPhone from the browser. You can select video quality, turn on recording, turn on the flash, switch cameras and save recordings directly to the monitoring device. Turning your old dust catching iPhone into an advanced security camera is one the best ways to utilize it. Most of the above mentioned apps are free or offer most of the required functions for free. So basically you can turn your iPhone into a security camera for free. However, if you like some advanced features and reliable service, then you might like to opt for a paid app. If you want to record your surroundings, then Instant Webcam is a good option. Otherwise, AtHome Camera will work great for you. If you have any questions or know any other great security camera apps for iPhone, let us know in the comments below.